*Sponsored series. See Disclosures Below. A vacation completely unplugged from technology and totally connected to family and friends is ideal, but not always possible. 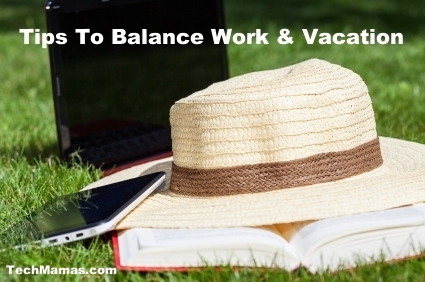 With today’s 24/7 jobs, sometimes a vacation requires keeping up with some work obligations while connecting with your kids and spouse. I have worked hard over the years to achieve the best work-family balance while away from home, avoiding those sideways glances at email while pretending to listen to the family conversation. Not that I have ever done that. 1. Create Daily Quiet Time: When I am traveling with my family, we create a quiet time when each of us chooses a quiet activity. Active outside activities consume the morning and early afternoon and have quiet time when we return to the room. One of my twin 10 year old sons enjoys reading a book while the other listens to an audiobook. My teen enjoys learning how to play new songs on his guitar by watching Internet videos, playing along on his guitar. My husband and I use that time to check our emails and do some quick work. We then have family time the rest of the day. Because our quiet time is limited and follows some outdoor exercise, we allow technology as long as it is age appropriate and parent approved. 2. Time Swap: There are some moments during vacation when one adult needs quiet time during a group event. During our vacation a few weeks ago my kids and their cousins went bike riding. Because my kids are older, only one parent was required to keep the kids on the bike path and out of the street. While I took the kids on their adventure, my husband went on his morning run and managed a few work emails. Then we switched with we came home, my husband playing a board game with the boys while I checked email. Some activities, like beach time, require the full attention of multiple adults. We call it “keep all eyes on the kids” time (no books or phones allowed!). It also helps to dress the kids in brightly colored swim shirts so we can tell them apart from all the other kids floating in the waves. 3. Prep Time: During a recent trip back east, we spent a day in downtown Philadelphia, enjoying the historical sites before heading to the airport. After a full day of American history, my kids wanted to stop in a park, sit on the grass and close their eyes for a few minutes. I knew that the plane flight was coming up soon and that I needed to download a document on my computer in order to squeeze in some work time on the plane. While the kids rested on the grass of Washington Square next to the Tomb of the Unknown Revolutionary War Soldier, I used my mobile WiFi hotspot to log onto my email and cloud storage then downloaded the needed files to my desktop. How do you fit in work (when needed) while on vacation? Disclosure: This is a sponsored series. I received an AT&T Unite mobile hotspot as part of my sponsorship. My words are my own. I am happy to say that my AT&T Unite has enabled me to have WiFi wherever I was this summer. For more information, visit att.com/Unite or connect with WiFi Family powered by Netgear.